What would Michelle Obama say? 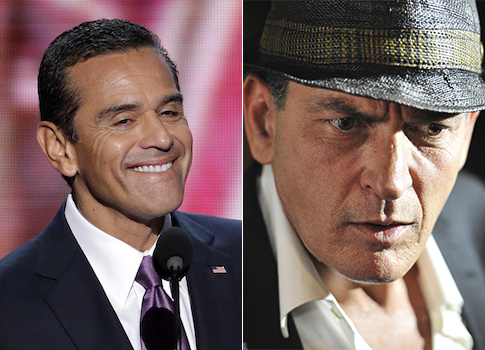 Master parliamentarian and intellectual heavyweight Antonio Villaraigosa has made a new friend, according to the Huffington Post. Politico reported on Thursday that Eva Longoria will co-chair the 2013 inauguration committee along with former Ambassador to Sweden Matthew Barzun, Democratic National Committee National Finance Chair Jane Stetson and technology entrepreneur and Obama bundler Frank White. Penny Pritzker, the billionaire heiress whose family owns the Hyatt hotel chain, took a ride on Air Force One this afternoon from San Francisco to Portland, Ore., where President Obama was making a series of fundraising stops. Actress Eva Longoria defended the portrayal of Latinas in Devious Maids, a television show Longoria will executive produce along with Marc Cherry, in an interview with the Huffington Post. Last year, Beso LLC, a Las Vegas restaurant and nightclub owned by the actress and co-investors, filed for bankruptcy to restructure $5.7 million in debt and other liabilities. The restaurant and club later closed briefly, jeopardizing the jobs of 128 full- and part-time employees, before re-opening after a restructuring and partial sale.